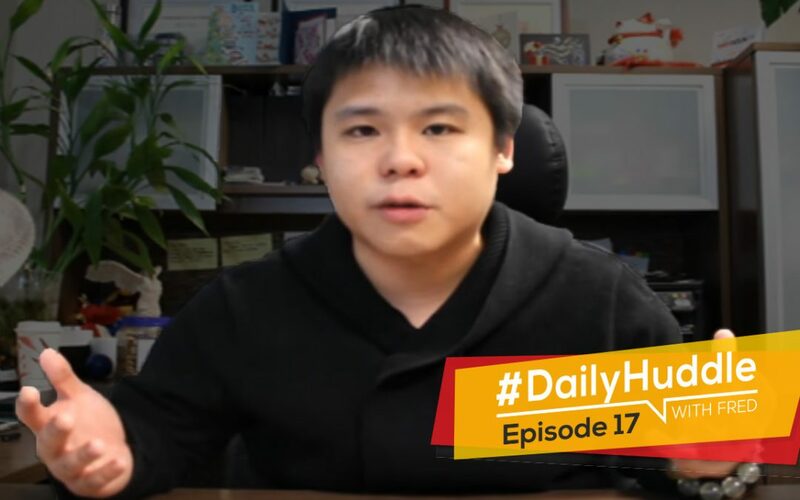 Fred Lam here and welcome to our daily huddle episode number 17. Before we begin I want to basically share with you that I am still very, very ill and I know that today we are actually coming on live pretty late and I do apologize about that because I went home grab some dinner and got a quick rest because I don’t know what’s going on but I think I have a really bad flu right now. So, I’m having like sore throat, I’ve been coughing, I’ve been sneezing everything that I can think of is actually happening to me right now so I do apologize that I am coming on live a little bit late than often. However, at the end of the day I’ve made a commitment to you that I’m going to be live every single day from Monday to Friday to answer five questions in detail. Now if you want your questions to be featured simply go to www.fredlam.com/ask and fill in that form and then by the time that we get to your question we’ll make sure that we get your questions featured. Before we actually begin going into the question, now today’s biggest topic from one of the questions is going to be “Why am I getting no sales from Facebook for my Shopify store?” And as a matter of fact I actually had a couple of hours ago an in-depth training with my members and they were blowing away on how data can actually show if a product is selling or not and to prove to them it is very important to not to fight to data. So, one of the most key important thing that I want to bring up and this goes for any businesses regardless if this is ecommerce, affiliate Marketing or email marketing. If the data comes back telling you that the audience or the product or the funnel is not working simply just pause it and move on to your next funnel or your next product. Do not be attached to what product you sell and what funnel you’re advertising or what opt-in page you are using because that will ultimately sabotage your business. It’s going to waste a lot of time, money and effort. You want the data to actually tell you in 24 hours, 48 hours and 72 hours on what you should be doing moving forward based on those data so that you are becoming a wise entrepreneur and not wasting money, time and effort on things that you do not see an option of having it to work. So, very, very important stuff and obviously I will go in detail on what I mean in just a minute when I start going through one of the questions. Now, I do ask you for a commitment in return number 1 is to keep investing in yourself when you are presenting an opportunity that you can see that you are going to gain value in, number 2 which is super important is that I want you to be committed to be here every day in our live daily huddle. So, in order for you to actually get a notification on when I’m going to be live make sure you subscribe to my YouTube channel, click on the notification box so that you receive an email the minute that I actually go online and also make sure you actually like me and follow me on Facebook so that you can see when I’m coming on live, alright. [0:04:33] Question 1: For every 500 impressions I'm getting 5 clicks which is $5 per click and this yields 0 conversions. Do you have any suggestions? Maybe you need more info before you can offer suggestions, so feel free to ask me for more info first? You are the best! I love your altruism! Thank you for your help. Inspired by your YouTube videos I just created a new Shopify Store that provides top quality fishing apparel to folks who love to fly fish for predatory species of fish (sharks, barracuda, etc.). I created some ad campaigns carbon copied after the stats in your videos, (giving away free stuff, mobile news feeds, narrowed audience, etc.) but they are not producing sales. For every 500 impressions I’m getting 5 clicks which is $5 per click and this yields 0 conversions. Fred: Well obviously if you only got five clicks it’s very rare for you to actually accomplish 20% conversion rate. I’ll be flat out honest with you. The industry average hovers around 3% to 8%, if you do over 8% you’re like a God in the internet. First of all Nick, I can actually tell you right out the gate that your CPM (Cost per thousand view) is extremely expensive. I don’t know why, it maybe because the market that you’re going after are older men. Here’s a reality when you’re advertising on Facebook the baby boomers who are basically 50 plus and above either men or women they are the most expensive demographic on the internet. Why? Because they are the people that consistently buy products online. Now, if you actually got 500 impressions and only 5 clicks so I can actually calculate it back and actually see that your CPM is just so crazy and with your Cost Per Click being $5 a click there’s something wrong. If you are actually getting $5 a click that really tells you that either your audience is incorrect or the product that you are selling does not resonate or pick interest to that audience. So, if I were you I would move on right away and test other products first because if you’re trying to actually make this ad work I want to tell you “Good Luck” chances are it’s superbly slim to get a $5 cost per click ad to go down and actually make it work. The reality is that when you’re advertising on Facebook you need to make sure that your Cost Per Click link ; I’m talking about the link there’s a difference between cost per click ALL and cost per click LINK you want to make sure that you achieve less than a dollar 50. The ideal number is less than a buck but right now you are actually going after $5; it is going to be super hard for you to cut the cost regardless of what you’re doing. So, my guess is either your target is incorrect or your product is completely not relevant to what the audience is really searching for. So this proves to you again like I said earlier you may be too attached to the product trying to make it work but ultimately at the end of the day there are so many other products that you can actually sell to these people who love to fly-fish. I heard of this term once when I was working at BMW, one of the owners of BMW actually loved to go fly-fishing and I think it’s a pretty crazy sport. They’re like in speed boats and doing all those other stuff. I didn’t have a chance to actually play around with it or understand how it works but here’s the thing when you go fly-fishing well maybe you can sell an accessory that’s going to protect your phone from getting like dead. If it drops in the water you may want to sell some waterproof stuff, well if they actually go on a boat you may want to actually have an SOS kits or when they are actually I don’t know I’m not really into fishing or maybe some really special fishing [inaudible 09:02] to really attract those people to come into your store first. Again, at the end of the day for any of you who are running a Shopify store here’s the most important thing, you need to find a front in product and I call this the “BAIT”. You want to basically find a product that will attract people to go into your store and start buying from you. Now that product may not generate profit right away it may just break even or all those other stuff but what it will help you to do is that it will start people go to your store you can start up selling, you can start creating email strategies in place and actually make your profits from the back end. This is how it all works and again the most important thing especially when you’re starting out is that you need to ultimately start finding products that can break even right away. If in 24, 48, or 72 hours that product doesn’t work move on. Absolutely move on, you need to let the data tell you if it is working or if it is not. Do not fight the data because again the data doesn’t lie and I keep telling you that because that’s the truth and that’s the reality. So that’s what I would suggest you to do right now, drop whatever product that you’re selling because $5 cost-per-click is way too high. You need to find products that will resonate with the audience and get you cost per click link to be again less than a dollar 50, most ideal is getting less than $1. And I would bet you if you guys right now who are watching to go ahead and start actually looking at your Facebook ad report you will have a lot of ad campaigns that have a higher cost per click link that’s above a dollar 50 and you’re still running it. I can bet that’s happening and if it does, just turn it off move on and find another product. The beauty of using my 5-step system is that in reality, it doesn’t cost you any money to upload a product to your store. Why waste time? Continue to hunt the product because you only need one product to actually create a six-figure business. I hope that really help you guys out and understand about all that. [0:11:35] Question 2: Crossfit. Growth industry? That’s a really good point that you brought this out. In the exercise world, CrossFit is actually have been booming that is true, it is booming. A lot of people are moving toward CrossFit right now. However, if you’re trying to sell a physical product to someone that’s interested in CrossFit it is going to be superbly hard because there are so many large exercise brands out there from people endorsing from UFC, people endorsing from all these other sports, so for you to actually make some noise in the industry it is not that easy. However, if you consider yourself a juice monkey and if you love CrossFit here’s what I want you to do. If you really want to tap into this industry you have to be in the CrossFit industry. You need to start getting comfortable on creating your own Instagram page, your own YouTube channel and your own Facebook page and what I want to challenge you to do Adam if you are one of those juice monkeys who loves CrossFit I want you to post every single day some tips about CrossFit and show people how you perform CrossFit exercises. By doing this what’s going to happen is that you are actually going to build a following. If you look at Instagram some of the top following Instagram influencers; there’s a massive amount of people who are in exercise, fitness, CrossFit and muscle building. And if you narrow down your niche to be CrossFit and you shoot a video and you give out content every day you are going to actually get a following that would just love to see how you train with CrossFit. Yes, I know that in the beginning it’s going to be a lot of work but you’re going to thank me afterwards because what’s happening is that right out the gate yes your doing a lot of work but if you actually do that you are going to build a following which at that point when they actually see that you are selling your own CrossFit product. It doesn’t even need to be products that you own. You can actually drop ship it with AliExpress and people are just going to buy because they love the value that you’re giving to them. They look up to you now as the CrossFit mentor and basically what you can do is you can actually order some products on AliExpress and simply feature that product of you using that product for CrossFit. Simple enough and people are just going to buy when you build that following. As a matter of fact, here’s what you can also do, I’m giving you the entire business model right now. You can then create a DVD or an online course on how you can lose weight and get fit by simply doing CrossFit. It’s just like insanity and a beach body that’s what they do they simply create a video series of how you follow their exercise and in your case you create a CrossFit exercise and you just simply just sell it and get results and people before and after photos BAAM! You are done. Then what you can do is that you can sell a higher program for like $5-6,000 to actually spend 4 days with you to completely change your diet, to completely show them what they need to do on a daily basis to really look at may be doing blood test and all those other stuff will cost you a couple of hundred bucks by a local doctor or whatever and basically have a complete program in place where they have to fly down to your area and start basically going through a $5,000 program live in person. So, now what do you have? You have a following, number 2 you have your own digital products to sell. Number 3 you now have a high-end product that you can actually offer and the beauty of all that is that it’s going to give you the opportunity to do Affiliate Marketing, to do Email Marketing and a lot of other great stuff because people look up to you as the CrossFit expert. I hope that really helps you Adam and that really inspire you. Now put in the word “WOW” into the comment box or on YouTube right into the live chat if that blew you away like I literally just gave an entire business model away. It doesn’t need to be a CrossFit it can be anything. It can be you cooking paleo recipes, it can be you simply I don’t know playing chess. I actually had a guy that actually asked a question about chess, it can be maybe you playing golf. When you talk about golf, I remember one of my friends own an agency and it was like five years ago and he is making like killer money by helping a client do golf videos. You won’t expect that but exactly that’s the exact model that happen; physical product, digital product, high-end coaching. And that’s exactly what you can do but most importantly is that you’re going to get uncomfortable. I know that for me getting on camera is super uncomfortable. I actually have to jump over the fear of me getting on camera after like I don’t know God like a year or two years before I started feeling comfortable on getting on camera right now but at the end of the day once you’re able to get through that, listen, the sky is the limit because it just gives you so much opportunity to do a lot of things. I really hope that helps you out and that inspire you to get started right away. [0:17:38] Question 3: Can I or Should I have several Pixel Trackers for the different sub-Niches? When having a more generic store Can I or Should I have several Pixel Trackers for the different sub-Niches? If not, the Pixel that is in place will not have deviated data because of the several campaigns that I can be doing in the Different sub-niches? Here’s the deal Carlos, you do not want multiple pixels right into your Facebook account. I know that some people are telling you to do that but in my personal experience it completely screwed over my store. I used to have a campaign that was working phenomenally well and I was like “Okay, cool let me create another pixel and run another funnel.” I did that for four different funnels and I would tell you it screwed up everything even my top converting campaigns completely just tanked. The reason why is that you are now causing a confusion to Facebook pixel because every single time that a purchase is fired all four of the pixels will still fire the purchase event back to the pixel data so now you’re basically confusing the Facebook pixel. What is important for you if you are using a general store you need to A.) either get pixel bay which is an app that I created just to solve this problem or B.) simply create a custom conversion based on the product that you actually have in your Shopify store. So each product inside Shopify actually contains an ID, a unique ID specifically for your product. You want to create a custom conversion of the pixel of that product so then when you’re advertising; let’s say you’re advertising a pen versus you are advertising a wallet then Facebook knows that “Okay, your ad right now in this asset is just primarily wanting to sell the pen.” And you’re giving the data because you create custom conversion on that pen Facebook will focus on selling that pen for you. On the other side, you create another conversion based on this money-clip wallet and Facebook will again only serve your ad to make sure that you get the money wallet sale because you told Facebook specifically that that’s what you want. Now, you have different pixel for different products and having it all under purchase event, you are going to get people who want to buy and to see the wallet ad. And the wallet ad showing people who will buy the pen, so it’s going to create confusion and at the end of the day you are affecting the algorithm. That’s what you do not want. You want to actually make sure that you don’t have more than one pixel. I know that some people are teaching about it and you’re getting good results, good for them but from my personal experience, it really screwed things over. So either get pixel bay or basically figure out the advanced method of using custom conversions. [0:20:55] Question 4: Facebook Purchase Pixel - Wouldn't it be better to aim for getting content views to allow Facebook to get enough data on your target audience? If not, would you be able to explain why choosing the purchase pixel from the start is more profitable and cost effective? Moving on to the fourth question. It is by Jaye O’Toole. This is in regards to the Facebook purchase pixel. You mention that that this is a good website conversion objective to start with. I’m just wondering but Facebook wouldn’t have enough data to search for your target audience based on this objective, it would also be rather expensive, especially with the CPM (Cost Per 1000 Impressions) if you were just starting out. Wouldn’t it be better to aim for getting content views to allow Facebook to get enough data on your target audience? If not, would you be able to explain why choosing the purchase pixel from the start is more profitable and cost effective? Again, I address this question at least like two times in our daily huddle. The reason why is that when you tell Facebook that you want to purchase, they will look for the audience within their network, within your targeting that will most likely buy from a third party website. If you are going after the few content here’s what’s going to happen, Facebook will drive a lot of traffic for you. Yes as some cases you might get a better CPM. However, Facebook basically says, “I’m going to stop and finish my optimization” because you told me all you want is people going to visit your landing page and that’s it. When that happens you are basically left dependent on your product page having it to make sure that it converts like game busters. It has to be a super unique product. It has to be basically so mass marketable that any person that goes to the page will buy. If that’s not the case then you’re basically shooting yourself in the foot because again, you’re basically just telling Facebook that you only want people to actually view the content and that’s what Facebook will deliver to you. Facebook won’t care if you’re actually getting a sale because you told Facebook that you only want to view content. So what you want to do is make sure that you tell Facebook and say, I don’t have enough pixel data right now but here’s why I’m advertising with you guys, I want to get more sales. I want to get a purchase so I want you to go into the audience pool and find me people who will most likely convert. Here’s the reality, let’s say that you have a pool of people who are a million and in order for you to actually get the entire 1 million, you need at least couple thousand dollars a day in order for this million audience size people to actually see your ad. Here’s the reality, let’s say that you have a pool of people who are a million and in order for you to actually get the entire 1 million, you need at least couple thousand dollars a day in order for this million audience size people to actually see your ad. What will happen is that Facebook because of your budget Facebook won’t be able to serve that all 1 million. But if you tell Facebook that you want the purchase then through that 1 million, it will look at who are the audience who will actually most likely buy through the Facebook ad and they will serve the ads to that audience first. That’s why you still want to choose website conversion regardless what you are doing. Now, let’s move on to the last question of the day. I’m not going to change battery; it’s going to take time so I rather just flip my iMac web camera on. Last question of the day is by Scott Walker. At the end of the day yes you want to basically tell people that we have up sells in place. Potentially let them know that hey you may receive different packages because our warehouses are at different places. That’s what you want to do and again, at the end of the day, do you really have to do it? Not really. As long as your customer receives the product that’s all they care about. The answer is simply, it doesn’t matter. It does not matter. Before I end our daily huddle today, put in a random word into the comment box and into the live chat and tell me what do you guys think about today’s episode other than obviously having myself needing to change the battery on my camera and you guys are seeing my super messy office that I am in right now. Tell me what you guys think about today’s daily huddle. Awesome by Angelia, that’s what I’m getting. I can see a lot of people here right now and you guys are being super shy. You’re the man by Goodyear! Tracy said [inaudible 26:19].Cool, cool, cool. Random. I’m not sure why Leanne would say random. Awesom3. Get better soon. Peng Kong On said I love you. Sam said squeezy. Noel said amazing. Jack said very helpful. Jessie said Thanks. Before I let you guys go, here’s the deal seriously if you guys want to actually invest in your knowledge and if you have not sign up for rich dad summit right above this video on Facebook there’s a link and right in the video description below on YouTube there’s a link. Make sure you click on that link and pay that $1. It’s just $1 and what you get enroll into is your ticket to a 16 hours of amazing training hosted by Mr. Robert Kiyosaki and his entire team along with the industry titans to help you learn how you can make more money and how to use money to make more money. Seriously if you guys are watching this right now and you still have note secure your seat for that $1 go to the link above this Facebook video or right below on YouTube click on the link, save your spot. If you have enrolled and got your ticket for the rich dad summit, put in a ME into the comment box or into the chat box on YouTube and tell me if you have signed up. It’s very important. You ultimately need to make that investment. It’s just a dollar. This is like the best dollar you can make. Do you want a can of soda or do you want a bag of chips? Or do you want to actually learn from rich dad himself? If you want to learn straight from Mr. Robert Kiyosaki and his entire team of industry titans which includes me click the link above this video or below right on YouTube and make sure you save your spot. That’s really it for today. I actually have something crazy coming up on Monday that will completely blow you guys away. I love making announcements and you guys know that when I make an announcement it is always a real deal. It is not just some random bull crap that I make up. It’s just always going to be something that will blow you guys away and absolutely love. Put in the word excited right into the comment box on Facebook and in the live chat in YouTube if you guys are excited to hear my announcement this coming Monday. I would have to tell you that what I’m going to share and announce on Monday is worth over $10,000. So, put in the word excited because I’m going to actually showcase about this in your daily huddle on Monday. I’m going to set the time; our daily huddle on Monday will be 6PM Pacific, 9PM Eastern. Put in the word excited if you guys are excited about my upcoming announcement on Monday. Make sure you subscribe to my YouTube channel, like me on Facebook so that you guys get notification when I’m going to come on live. Most likely I will be coming on live at 9PM Eastern, 6PM Pacific so that basically no one misses out on my massive announcement that I will make. Last but not the least, if you have not sign up for the rich dad summit link is above this video on Facebook and right below on YouTube. Sign up, save your seat, secure your spot and I look forward on seeing you tomorrow and every single weekday. That’s it for today’s daily huddle guys, I look forward on seeing you again tomorrow. Bye now!